The black WS-421 Heavy Duty Fully Adjustable Keyboard Structure from QuikLok is a portable, heavy duty, height and width adjustable stand with foldable legs. Its sturdy frame provides a solid base for supporting all kinds of gear, including keyboard or controllers, digital pianos, DJ coffins, recording, and audio equipment. Its design allows for maximum leg room for comfortable playing, in addition to providing a large area for placement of floor pedals. The height is adjustable to 12 positions, making it suitable for tall musicians. The telescoping frame is width adjustable, allowing the stand to be custom tailored to the exact size of your equipment. 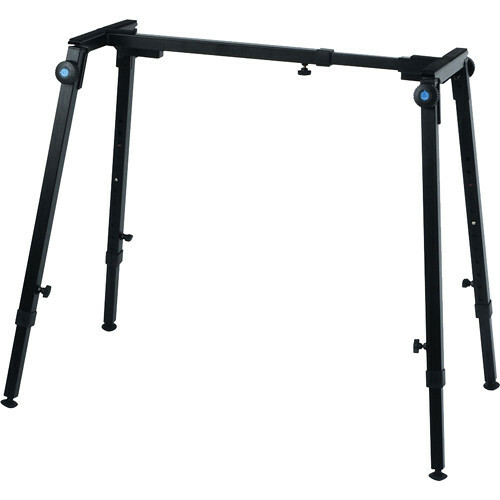 This stand is suitable for use at home, recording studios, stage, or rehearsal environments. Its heavy steel construction offers good reliability, and it folds flat for easy storage and transport. Box Dimensions (LxWxH) 29.7 x 19.3 x 4.5"
WS-421 Heavy Duty Fully Adjustable Keyboard Structure (Black) is rated 1.0 out of 5 by 1. Rated 1 out of 5 by JI from Terrible quality Bad welds, to the extent that one leg was at a severe off-angle, destabilizing the entire stand. Two out of the four large screws were so bent they wouldn't go in further than half way. I threw the whole thing out in the trash.